A depiction by David Jordan and Fergus Browne of what O’Connell Bridge could look like: But where are the cycle lanes? Where are the cyclists? ANALYSIS: An independent project which is seeking to “kick start change along the Liffey Corridor” is to present their vision of Dublin’s quays to Dublin City councillors today, but cyclists don’t fare well in detail of the new vision. The vision from Fergus Browne and David Jordan, who are both urban designers and urban planners, is called “the 21st Century Liffey Project” — including removal of clutter and more space for pedestrians. The research project is supported by but not endorsed by Dublin City Council. Separately, Dublin City Council and the National Transport Authority have been looking at the idea of a walking and cycling route from the Phoenix Park to the Point. That process seems to been stalled or at least somewhat slowed — an outline of route options and wider public consultation was supposed to follow a limited stakeholder consultation held at the end of 2012. 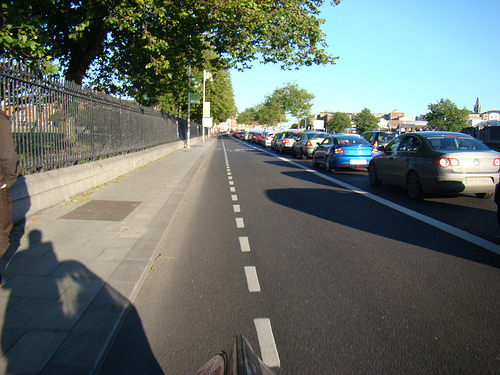 A current shared bus/cycle lane on the quays. At arms length, the city council also supported without endorsing an Innovation Dublin workshop which looked at how a cycling route could fit into the quays. It was also supported by the Dutch Embassy, with help from Dutch cycling experts at Fietsberaad and the Dutch Cycling Embassy. Two team of engineers and planners looking worked on outline routes — we reported on this back in 2011 (read about it here). Both teams went with the idea of a two-way cycle route on the north quays. Browne and Jordan, however, don’t like the Dutch-supported idea. The problem is by taking a “2030 approach” nothing will happen. Their proposals recommend no bus lanes at pinch points along the quays which means buses commuters would be left stuck in heavy traffic as buses would be forced to share a singe lane in each direction with general traffic. This makes the proposals unworkable as buses carry the bulk of commuters into the city centre and so they need to be given priority. The Browne and Jordan project includes a number of mock-ups and drawings of their vision of the quays. But, as others online have pointed out already, cyclists and cycle paths are not included in most of these images, including the most use image of O’Connell Bridge. We looked extensively across the 21st Century Liffey Project website, on their Facebook page and in the summary given to the council — cyclists and cycling infrastructure hardly feature at all. It was only when looking at a page on the project’s website when it clicked why cycle paths were not visible in many of the images: The cycle paths in the vision are narrow and disconnected — cyclists are expected to merge back into traffic at junctions, which partly explains the lack of cycle lanes on the O’Connell Bridge mock-up. The core design used seems to be a copy of the original poorly designed cycle paths along the quay side in the Docklands — off road cycle paths which end before junctions and pinch points, where cyclists have to yield and merge with general traffic. This kind of design would likely not be allowed under new higher standards outlined in the National Cycle Manual. You’d be very hard pressed to find such designs in Amsterdam or Copenhagen. The law stating that motorists should not enter advance stop boxes without the way ahead being clear is not respected and hardly enforced at all — but the main problem with this design is when traffic is flowing and cyclists have to yield and have no where to go if traffic is heavy and flowing. Yielding the odd bit isn’t the end of the world — but doing it over and over again along the quays makes the tracks unusable as intended. Cyclist safety and priority is compromised far too much. Cyclist need continuous cycle paths which don’t end at or just before junctions. The experience in the Docklands is that many cyclists just keep to the road and many others use the footpaths at pinch points. This would be a far larger problem closer to the city centre. And, yes, Dublin City Council and NTA have been looking at quay-side cycle paths, but the design of these are expected to be continuous, where cyclists traveling along the river are not forced to merge with traffic again and again. The Browne and Jordan project includes some excellent work on public spaces, but it’s not fit for a city which already has many cyclists and is set of have a mix of cycling and buses as the core part of the transport mix for the city centre. Footnote: The submission to the council has already resulted in confusing media reports, and it is likely also to add confusion in other ways. It recommends “Re-designating the N4 National Primary Route along the Quays” when nearly all roads within the M50, including the quays, have already been re-designated. It also suggests “Re-designing the pedestrian crossings based on the wide zebra crossing based model” — would seem to require a law change which is out of reach of the city council — a point not mentioned. In the city centre, the pedestrian is king!!! It is no place for cyclists – get off our footpaths!